There wasn’t a local stopper for ages, though we are in possession of tickets for the local service. 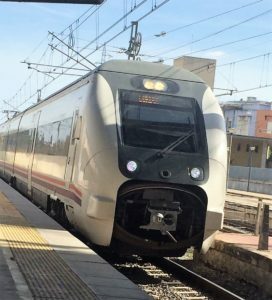 Let’s get on the Media Distancia anyway – it goes to the same destination – and hope that no one comes round to check tickets ( though we know someone always does ). On board there are only a few seats available, which we take. When we reach El Puerto, the next stop from Jerez, folk get on who claim these seats and we stand in the passage at the end of the carriage. Curiously, there are others standing there already, although everyone has, or is supposed to have, an allocated seat. Still no sign of a conductor. We share the passageway with the green-haired sons of a jolly family. An ageing fairy walks past to the drinks machine, her wings snagging on the overhead luggage rack. There is a preponderance of glitter and sequins, each face is an art work. Men wear shiny trilbys. stops the traffic for us. His face is deadpan as we all walk by, a collection of sailors, hippies, angels and insects. 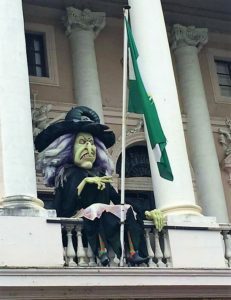 Plaza San Juan de Dios is thronging with folk, watched over by the giant witch on the Town Hall balcony. 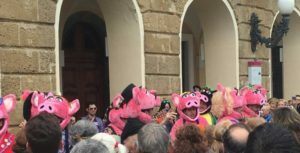 At her feet are a group of singing pigs, the first of the chirigotas we will see that day, performing to an appreciative audience ( see 2017 Festival de Jerez Plus ). Further along are a group of cowboys, complete with kazoos. But it is in the wide square in front of the Cathedral that there is sensory overload, a veritable Babel tower of singing. Chirigota groups have secured pitches on the cathedral steps and each is attempting to out-perform the other. Everyone is wearing day-glo wigs and has painted cheeks (and that’s just the crowd). We follow an up-right cow along the row of singers. Along Compania we are absorbed into a dense, almost static, but good-humoured crowd, as folk try to get into or get out of the Cathedral square. Small children are passed over heads. In Plaza de los Flores we encounter more chirigotas one in traditional zany garb the other with a distinctive Harry Potter look. We escape passed the Post Office to the Torre Tavira and thence along Sagasta out of the thickest crowds. Seats outside a corner bakery provide respite and sugar and we are able to people watch, the real joy of Carnaval. It is often remarked, usually at Panto season or at major sporting events, that the English male likes nothing better than dressing up in women’s clothing. 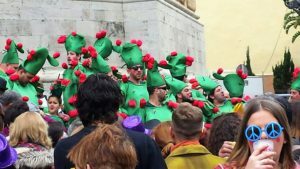 Yet I have never seen quite such a concentrated and vivid collection of men dressed as women as at this year’s Carnaval. Forget the male nuns, they are so passe and the male angels could be forgiven,despite the balloons, as the gender of angels is undetermined. It was the panto-dame equivalents, often in fright wigs and revealing large amounts of flaccid flesh, which surprised. Costumes were inventive and fun, like those of the group of gladiators ( What is the collective noun for gladiators? ) with IKEA tape measures forming the fronds of their roman skirts and mop-heads the plumes on their helmets. 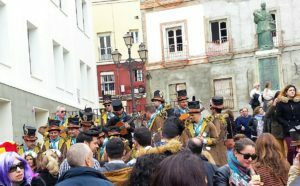 Those not playing instruments wore brightly coloured Marigold-type gloves to make their gestures better catch the eye. 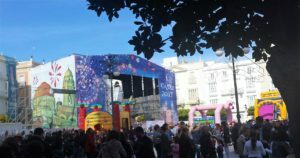 Most were on foot but some had transport from which to regale the crowds around Plaza San Antonio, where a large sound stage had been erected amid the bouncy castles and other children’s games. We walked down to the sea and along the Campo del Sur, to approach the Cathedral again but from the seaward side. There we saw chirigota members relaxing, taking time to eat, drink and rest before returning to the fray. 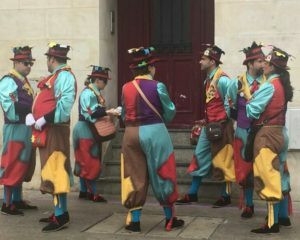 My companions, or those of them unfamiliar with Carnaval, were open- mouthed with amazement, delighted and bamboozled. 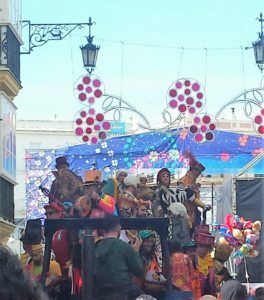 One week ago today, the final Sunday of this year’s Carnaval de Cadiz. N.B. In the spirit of Carnaval, of games and puzzles, puns and double entendres, this post includes five hidden titles of stories by A.S.Byatt. See if you can spot them and let me know if you do.